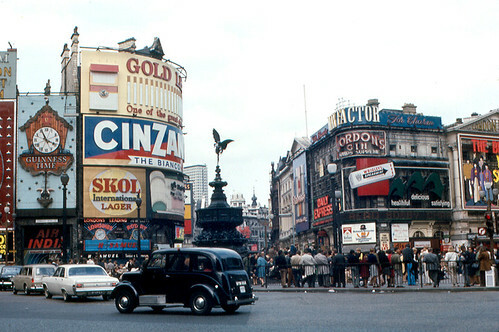 The advertising signs in 1968, when traffic still went around Piccadilly Circus. A good view of a London "black cab." The Statue of Eros still has the place of honor at the center of Piccadilly Circus. It is at the top of a memorial fountain to the 7th Earl of Shaftsbury (1893), who was famous as a social reformer. The fountain and statue were moved to a corner of the area when Piccadilly Circus was rebuilt in the late 1980s..